Three of the most common diseases that make up arthritis are: Osteoarthritis (OA), Rheumatoid Arthritis (RA) and Juvenile Arthritis (JA). A progressive degenerative joint disease characterized by the breakdown of joint cartilage, osteoarthritis is the most common form of arthritis. Rheumatoid arthritis is a systemic disease characterized by the inflammation of the membranes lining the joint. This inflammation can cause pain, stiffness, warmth, swelling, and sometimes severe joint damage. Juvenile arthritis is a broad term used to describe the many autoimmune and inflammatory conditions that can develop in children ages 16 and younger. Click here to learn more about arthritis and how to manage and live with the disease. Fact or Myth? 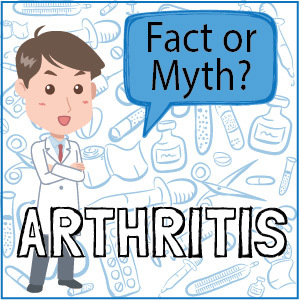 Click on each of the following to learn the truth about arthritis. Fact or Myth? Arthritis is an old person's disease. Myth. Although arthritis affects more than half of people 65 years of age and older, most people with arthritis, nearly three out of five, are younger than age 65. People of all ages are affected, including children and teens. In fact, juvenile rheumatoid arthritis is one of the most common chronic illnesses of childhood. Fact or Myth? Arthritis is just a normal part of aging. Myth. If this were true, most older adults and no children would have arthritis. However, nearly half of the elderly populations never experience these conditions, and an estimated 300,000 children are affected (www.arthritis.org). Furthermore, some forms of arthritis (e.g., osteoarthritis of the knee) can be prevented. Myth. Actually, while researchers suspect that some forms of arthritis have inherited links, that does not necessarily mean that you will develop it. There are other things that can lead to someone having arthritis. The cause of many forms of arthritis are not fully understood. (Arthritis Foundation Web site, “Questions and Answers”). Fact or Myth? My doctor said, “You have arthritis.” Since that is his diagnosis, I guess I have arthritis and it will only get worse. Myth. Those words “You have arthritis,” is NOT a diagnosis. Ask for a specific diagnosis. There are more than 100 types of arthritis. Getting the right treatment requires getting the correct diagnosis. Fact or Myth? Arthritis is a serious condition and in fact has the financial impact of a disease like cancer. Fact. In reality, more than 43 million Americans live with some form of arthritis. The annual cost to our society for medical care and lost wages resulting from arthritis is estimated to be $65 billion. It is the number one cause of disability in the U.S. If left undiagnosed and untreated, it can become a serious health problem. Fact or Myth? Arthritis can be treated. Fact. Although no “magic bullet” for all types of arthritis exists, research shows that early diagnosis and appropriate management can help reduce the consequences associated with many types of arthritis. Medication, education, physical activity, and surgery are four effective treatment strategies that can make a difference. One intervention in particular, the Arthritis Foundation Self-Help Program, has been shown to reduce pain by 20 percent and physician visits by 40 percent. Fact or Myth? Exercise can help reduce pain and improve function. Fact. Research shows that proper exercise reduces pain and improves function. Some exercises maintain range of motion and joint flexibility while others strengthen muscles that support the joints. “Low impact exercise, such as swimming, walking or biking builds strength and helps maintain overall fitness and reduce or maintain weight” (Ben-Ari, 2002). Fact or Myth? A family doctor is all you need to treat your arthritis. Myth. Actually a family doctor is only the first step in seeking diagnosis and treatment. He may send you to a rheumatologist, an orthopedist, an occupational or physical therapist, or a clinic for pain management. A team approach is beneficial. Fact or Myth? Weight is not a factor in causing arthritis. Myth. Excess weight can lead to osteoarthritis of the hip or knee. In fact, obesity speeds up the rate of damage therefore weight control is important. Fact or Myth? The most common type of arthritis is osteoarthritis (OA). Fact. Actually, the most common type is osteoarthritis (OA). More than 20 million people have OA compared to 2.1 million people who have rheumatoid arthritis (RA). Fact or Myth? If you have osteoarthritis (OA), you should “take it easy” to reduce pain and loss of function of joints. Myth. In fact, the first symptoms of osteoarthritis (OA) are a signal for a regular, dedicated exercise program to increase heart, muscle, ligament, and bone strength.